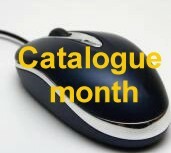 We return to Catalogue Month, during which the Bioscope is highlighting freely available filmographic catalogues and databases for silent film, while entering them into the new Catalogues and databases section of the Bioscope Library. Next up is the first electronic database to be listed, though it is a resource that we have cited several times in previous posts as among the most useful and reliable out there. 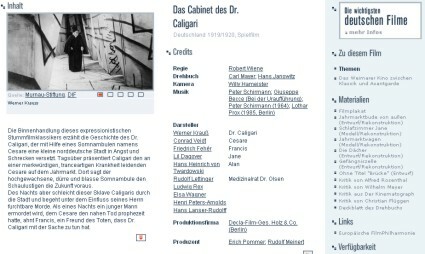 The database is the Deutsche Filminstitut’s Filmportal, an encyclopaedic database of information on German cinema. Filmportal documents some 73,500 German fiction films from 1895 to the present day, and is effectively the German national filmography. 7,000 of those records go into great detail, with synopses, reviews, posters and other illustrative material, photographs etc, but even the most basic records list title, cast, credits, and release information, taken from primary sources. There are also 165,000 names, 3,000 of which come with detailed biographies, and names and titles are extensively hyperlinked, making Filmportal eminently, indeed compulsively, browsable. It is also bi-lingual – the site’s primary language is German, of course, but all introductory and explanatory material is also available in English, with further English content promised for the future. Searching is by a small search box on the front page, with an advanced option simply letting you search by title, person, role name, content, or freetext. This is very useful in itself, but it is a little disappointing not to have a more comprehensive advanced search offering allowing one to select across time periods, or by combining search terms. It isn’t possible, for example, to determine how many silent films it covers, or even simply to search across the period 1895-1930. Nor does there seem to be a year-search option. To get the best out of Filmportal you just have to start with a simple enquiry, and then explore laterally by utilising the very impressive cross-linking. These are minor quibbles. In general Filmportal is rigorous, thorough and usefully set out (look out for the red arrow symbols which indicate further information for any one record). It doesn’t name its filmographic sources (except by inference when one is given a review reference or censorship record) but it exudes an air of accuracy and authority. It goes back as far as the first German film production of Max Skladanowsky, and as well as adding information on new German releases it keeps up a fresh feel by presenting new material on the front page and ever-changing features such as Director of the Week. It has a topics section which covers aspects of German film history in depth (and in English too), of which the section on Weimar cinema is going to be of greatest value to silent film afficionados. There’s more besides, including a multimedia section with trailers, rare film clips, and exclusive audio and video materials to its features, plus an English-language edition of the Deutsche Welle-TV programme Kino (unfortunately not word-searchable). Filmportal does an excellent job in promoting German film and an equally excellent job of making German film enticingly researchable. Go explore.